Summary: Being the middle child has its ups and downs. But for Grace, an only child who was adopted at birth, discovering that she is a middle child is a different ride altogether. After putting her own baby up for adoption, she goes looking for her biological family, including— Maya, her loudmouthed younger bio sister, who has a lot to say about their newfound family ties. Having grown up the snarky brunette in a house full of chipper redheads, she’s quick to search for traces of herself among these not-quite-strangers. And when her adopted family’s long-buried problems begin to explode to the surface, Maya can’t help but wonder where exactly it is that she belongs. And Joaquin, their stoic older bio brother, who has no interest in bonding over their shared biological mother. After seventeen years in the foster care system, he’s learned that there are no heroes, and secrets and fears are best kept close to the vest, where they can’t hurt anyone but him. I first heard about this book when it won the National Book Award for Young Adult Literature, and it's been on my radar ever since. I recently bought a copy and started this book, and even though it's nearly 400 pages, I managed to finish it in just two days because I simply couldn't put it down. And I am so glad that I made that decision. This story takes you through the complicated lives of three adopted/fostered children who don't find out about each other until they're in their late teen years. There's Grace, who was adopted by loving parents and then eventually got pregnant and had to end up putting her own daughter for adoption. Then there's Maya, the youngest of the bunch, who lives in a fancy, expensive house with her two adoptive parents and her biological, miracle-child of a sister, and while their family is loving, they certainly aren't perfect. Finally, there's Joaquin, the odd one out of the bunch, who still finds himself in the foster system after some situations gone wrong. Each of the three kids has their own intense baggage to carry, and it's after Grace is distraught having given up her own daughter that she goes on a quest to find her birth mother, but then finds out that she has siblings instead. So the rest of the book is the navigation of that rocky relationship, making up for years of lost time, and finding out how their own little family fits in to their larger, more complex lives. And it's a really, really amazing story. I really enjoyed how this story was told in the alternating perspectives of Grace, Maya, and Joaq. You get glimpses into their lives and their secrets that they don't necessarily come forward with to their siblings, and each of their lives are both so different while also being so similar at the same time in a way that is really hard to put into words. But it's clear that Benway thought out these characters and their histories, and that hard work certainly shows. And let me just say, when the three finally make the decision to learn more about their birth mother...what you find out will definitely shock you, and it's definitely not something you'll be expecting. This book was honestly filled with so much emotion that I don't even know where to start. I laughed, I cried, I gasped, and I hung onto every single word that Benway put into this book, because I seriously adored it that much. I knew it was going to be a five-star read based solely on how deeply it touched me from the very beginning of the book! Robin Benway wastes no time getting into the action of the story and gripping the reader from the starting line. And in my opinion, that makes for a really great story! My favorite character in this story was definitely Joaq. While all of the siblings had their own histories to deal with, Joaq's fierce need to protect his sisters that he just met really stuck with me, and the fact that he was the only sibling not to be adopted made my heart break for him. So yes, I definitely had a little soft spot for him as the book progressed, and I was cheering him on (alongside his sisters) from start to finish! Another thing I really loved about this story was the bond that forms between the siblings. In just a few short weeks they manage to get so close, sharing their secrets and defending one another, being there for each other in a way that only family can. But it didn't feel like a forced relationship, either -- they didn't immediately become BFFs from the get go just because they had the same genetic makeup. It took some time to make their relationship steady, but once it was, it was a really heartwarming thing to see/read. As for any critiques on the story, I can't come up with a single one. I loved this book from start to finish, the pacing and the characters and the plot were perfect, and the ending left me in a puddle of happy tears that took me a few hours to get over. It had all of the ingredients for an excellent story, and it certainly followed through with it. 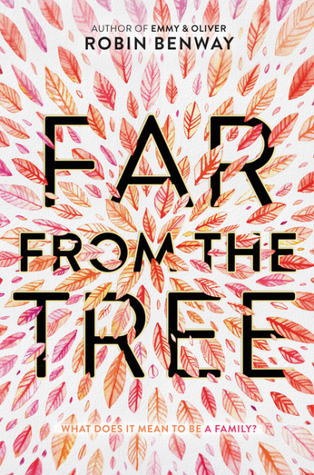 Overall, I really loved Far From the Tree and I am SO glad that I can officially peg this one as my first 5-star read of 2018. This book made me laugh, cry, and gasp at all of the right times, and I completely tore through it because I couldn't put it down! I even loved it so much that this past week I gave away a copy over on our Twitter page -- but even though that giveaway has ended, I still encourage you to get a copy of this book -- either through borrowing from a friend, winning a giveaway, buying a copy, visiting a local library, or whatever you most prefer -- because Far From The Tree is a heartwarming story that you definitely cannot do without. Hats off to Robin Benway for this spectacular book, which I loved even more than Emmy & Oliver, the first book I've read of hers that captured me with her writing -- I can't wait for more of her books in the future! I'm so glad you really enjoyed this book. I've never heard of it before now and it sounds really interesting. Thanks for sharing your review. This is definitely one I recommend reading!